Matthew is what I call a theological biography of Jesus Christ. That is the ultimate purpose of the Gospel of Matthew is to reveal to us who Jesus is and lead us to follow Him. The Gospel of Matthew reveals the true identity of Jesus Christ, and when you know the true identity of Jesus Christ, you are invited and drawn to trust, worship, obey, and follow Him. You become His disciple. Now, we know that this is not always easy. Last time, we watched how hard it was for John the Baptist to follow Jesus. He was decapitated for following Jesus. And our Hide the Word verse right now says that we need to be ready to follow Jesus into sacrifice. We’re going to learn more about making those sacrifices as 2019 unfolds. So, today’s passage is a very short story, a very familiar story of a miracle. Anita just sang about it for us. We all know this one. In fact, this story is in all four of the gospels. Except for the resurrection, this is the only miracle story that is in all four of the gospels. It is one of the most famous Bible stories that there ever was. And you already know the whole thing. Who does this story reveal Jesus to be? What does this story teach us about Who Jesus is? 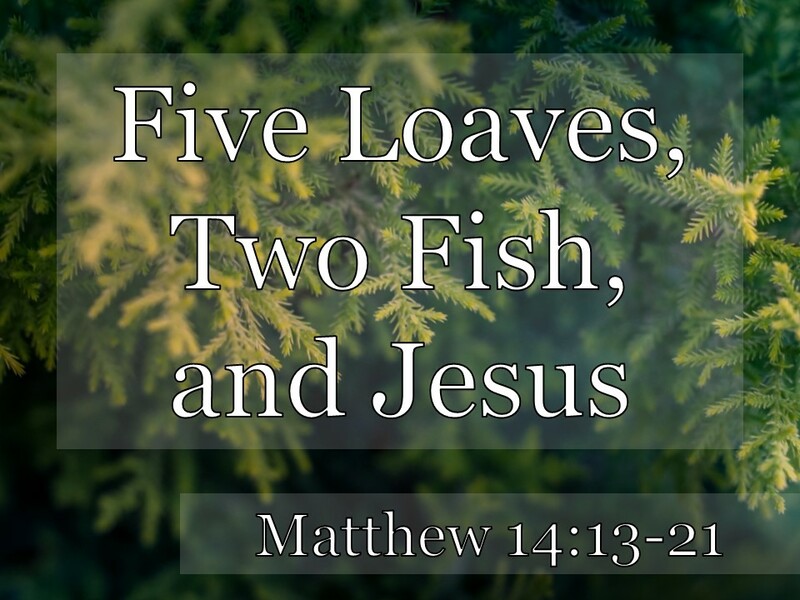 How should we follow Jesus because we have read Matthew 14:13 through 21? Whenever I teach somebody how to study the Bible for themselves, one of the first things I tell them to do is to get out a notebook and put a line down a page and mark out two columns. And then read a passage of Scripture and write down what you see that passage teaches about God or Jesus in particular and write down what the passage says about people including yourself. And when you put those two things together, you start to see your application to life. This is especially true when you study the Gospels. What does this story tell me about Jesus? 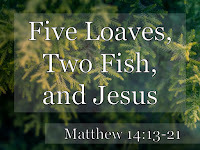 Yes, it’s about five loaves and two fishes. It’s about a big hungry crowd. It’s about some bewildered disciples. But it’s ultimately about Jesus. Today, I’ve five points of things I see here in Matthew’s gospel, that I think he’s trying to reveal to us about Jesus. All five are things that Jesus regularly does. And they all affect us in significant ways. Let’s look the setting for this miracle. Matthew chapter 14, verse 13. Wait a second. What had happened? Do you remember? I have always assumed that what happened was that his cousin John the Baptist had died. That is what just happened in verses 3 through 12. And had always assumed that Jesus here was grieving. But, I remembered this week that verses 3 through 12 are a flashback to an earlier time. So it’s possible that Jesus heard about what was happening in verses 1 and 2 which is that Herod Antipas has gotten wind of Jesus’ ministry and is worried that He is John the Baptist back from the dead. It’s quite possible that Jesus is pulling back to regroup and pray and maybe move His ministry to a new location as a strategic withdrawal to not escalate things before it was time. He tries to get away by Himself with His disciples. But it doesn’t work. Verse 13 again. That word for “compassion” is the same one as back in chapter 9. Unnn. It hurt in His gut. Jesus cared, and it moved Him to action. I don’t know about you, but I sure am encouraged to know that Jesus cares. Because this isn’t an isolated incident with Jesus. And it’s just like His Father. Not because you are so wonderful, but because God is so wonderful as to have compassion. I think a lot of people are hurting right now. • People are going through hard things. It’s really encouraging to know that the Lord cares. He sees our plight and is full of compassion. In this case, they were not just sick, they were growing hungry. And the disciples were getting worried that they were going to have a massive crowd on their hands with no food. They want Jesus to send the crowds off to fend for themselves. He asks them to do something that they don’t think they can do. I don’t know if He expects them to know how to do that. But He does expect them to trust Him and turn to Him for it. Right? I mean, what have they seen Jesus do so far? Heal the sick, cleanse lepers, forgive sins, cast out demons, even raise people from the dead. So if He says, “You can do this,” the proper response is what? This is not anomaly for Jesus either. He asks His followers to do things they can’t do, but because He is in their lives, they can. And that’s the way to be happy in Jesus. What is Jesus asking you to do these days that is basically impossible? At least, without Him. Getting bold and speaking up and telling people the good news? Counting up someone’s sins and offenses against you, and releasing them from that debt. Can you do that? Probably not on your own. But is Jesus asking you to? How about serving? Or giving? How about getting involved with the PRC? Stepping outside of your comfort zone and helping abortion vulnerable women. And notice that in His tests, Jesus invites us to be a part of the big things that He is doing. He uses us. He involves us. He puts us to work in His kingdom. When Jesus tests us, it’s always for our good. Satan’s tests are temptations. He wants us to fail. But Jesus asks us to do the impossible in the power that He provides. He wants us to succeed. He wants us to trust and obey. So the disciples scour the crowd, and this is all they can find. Verse 17. Matthew doesn’t tell us where they got them. We know from the other gospels that this was one boy’s lunch. Five probably hand-sized loaves, basically biscuits and a couple of little fish to wash it down with. A little bit of protein. And here they are in the wilderness. They are basically stranded out in the desert. Does this setting remind you of anything? I think we’re supposed to be reminded of Moses in the wilderness, right? All of Israel there camped in the wilderness, and they are hungry. And God through Moses feeds them with what? Manna, right? It’s also like Elisha in 2 Kings chapter 4. Elisha miraculously fed some hungry people out in the desert, as well. And they all got fed! Like Moses in the desert. He not only has compassion on them, but He provides what they need. Isn’t it wonderful that our God is a providing God? Today is our annual reports meeting. Read Darla Kyler’s treasurer’s report. It’s on page 12 of the annual report. And then she lists out some of the amazing ways that God provided for our church in 2018. That’s what was happening here with these five loaves and two fish and Jesus. Now, I think that calls for a response from us. One thing we ought do because of His provision is NOT murmur. Right? I mean that was the mistake the Israelites made with the manna. They complained about the bread from heaven! And so often we can get to complaining, too. And worrying about whether or not the Lord will take care of us. No, we need to trust in His provision. And we need to thank Him for His provision every day. Doesn’t it feel good to have a meal in your belly? I know that this sermon is going to get you hungry. All of this talk about bread and fish. Well, don’t worry, there’s a meal back there in the Fellowship Hall. Doesn’t it feel good after you eat? And it’s always good to thank the people who make the food. Thank you, Hospitality Team and everybody else who brought something today! But do we thank the Lord? Not just a token prayer, but a heartfelt thanksgiving for all that He has given us. Because it’s more than provision here, isn’t it? How many of them ate and were satisfied? You know that word “satisfied” means in the Greek? It means they were stuffed. They had all that they wanted. It was that feeling after Thanksgiving turkey and stuffing and mashed potatoes. They all went to go take a nap on the couch. Jesus didn’t just provide here. He went above and beyond and gave them satisfaction. Many scholars have thought that this miracle points to the kingdom. This is a picture of, a foretaste of the kingdom to come. Just like the parables told us about the kingdom, the miracles tell us about the kingdom, too. It’s a kingdom of satisfaction because of the King. The kingdom is a party. The kingdom is a banquet. The kingdom is a feast. And it’s all satisfying. It doesn’t wear out. It doesn’t wind down. It’s a party that never ends. I think that’s why there are so many leftovers here. It’s not just that Jesus makes something out of nothing. But that He makes more than necessary because He is overflowing with grace and blessing. And that’s what the kingdom is and is going to be like. Now, in the Gospel of John, the crowd makes the connection between Moses and Jesus. They get that He’s like a new and maybe greater Moses. But in John, Jesus takes it another step further. He says that He Himself is like the Manna. The new and greater Manna. He is the bread from heaven. Jesus Himself is the bread of life. Jesus Himself is the One Who satisfies, not just our bodies but our souls. Have you come to trust in Jesus so that He is the satisfaction of your soul? But Jesus will not disappoint. He will satisfy our souls forever. There is a reason why all four gospel writers included this miracle when they didn’t all include the rest. It’s because it’s a stunning miracle. Nobody else could do this. Nobody else has ever done anything like it. It’s miracle that takes the Creator to do. This shows that Jesus is the Creator. He makes matter out of nothing. We call this the “Feeding of the Five Thousand,” but it was a lot more than that! It could be 20,000 or more! Matthew doesn’t even tell us what it was like or how He did it. He just gives thanks, “Thank you, Father” and then breaks the loaves, and then starts passing it out. Until upwards to 30,000 people are fed. 1. Find and read the story of the feeding of the 5,000 in all four of the gospels. What different emphases do the various gospel writers bring out? 2. Why does Pastor Matt call the Gospel of Matthew a “theological biography?” What does that mean? How should that affect how we read it? 4. Would you add a sixth or seventh item about Who Jesus is from this short story? 5. In what ways is the Lord calling you to respond and follow Jesus because of studying this story together today? How can our group pray for each other as we apply it to our lives? 24. Who Does He Think He Is? 28. Are You the One? 35. What Is Really Going On Here?